Class of 1965 | Peabody High School National Alumni Association, Inc. Using the theme “Aloha to the ‘60’s,” the class of 1965 (BABY BOOMERS) celebrated Hawaiian style on July 13-14, 2007. Friday night began with a “Meet and Greet” social at the Walker House Bed and Breakfast on Crater Road in Petersburg. Everyone gathered there for a “Back. in the Day” house party. Classmates danced and listened to music from the past as well as the present. Clarinetist, Rick Elliott and local hula dancers and greeters, Crystal Bullock & Sonya Giles provided entertainment. Videos and photos from the past were, view and enjoyed by all. An exquisite feast was prepared for the group by Alyson Smith. 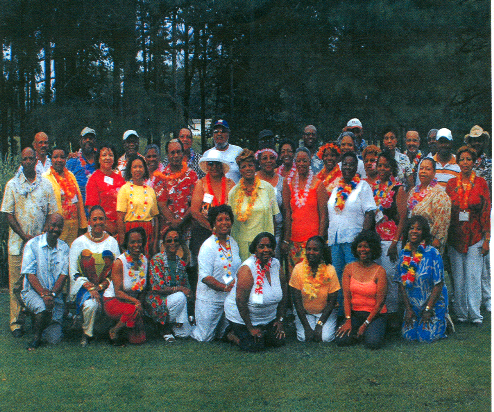 On Saturday, a Hawaiian Luau was graciously hosted by classmate Carmencita Stewart at her home in Dinwiddie County. Classmates were greeted and welcomed by Priscilla Lewis Carter, chairperson. A memorial reflection for deceased classmates was done with the lighting of a candle. Once again, there was music, dancing, and live’ jazz with vocalist Tyrone Wynn and Company. The highlight of the celebration was the authentic Hawaiian Hula Dancers (The Rose Bean Family). They used their hands to express stories of LOVE. They also described beautiful scenery of their island with their movements. Classmates were chosen to participate in a dance routine. They were taught the art of hula dancing. There was scrumptious food symbolic of the native Hawaiian cuisine that consisted of rice, fish, pork, chicken, fresh fruit and salads, masterfully prepared by Nanettte Hudson and Company. Beautiful decorations both days depicted the look and feel of a true tropical paradise; especially the illumination at twilight of the “Birds of Paradise” creations by the renowned Leon Richardson. The attire on both days was brightly colored. There were approximately one hundred classmates and guests in attendance, including past teachers. Classmates traveled from California, Ohio, Maryland, Pennsylvania, North Carolina and Georgia to attend this festivity. The limbo stick was omitted due to the uncertainty of how the sixties crowd might feel. Big Mistake! Everyone was awesome. The entire event was fun-filled and enjoyable. Classmates worshiped on Sunday at a church of their choice. This was truly a FIVE STAR celebration that will always be remembered.